Altai Tavan Bog National Park is located in the Far West of Mongolia, in Bayan Ulgii Province. Despite its remote location, the park and its beautiful scenery make it the premier attraction in Mongolia. Park includes highest peaks with eternal snow and largest glaciers in Mongolia. Tavan Bogd means Five Holly Peaks which are more than 4000 meters above sea level. Travelers can visit Potanin glacier 23 sq km, the largest glacier in Mongolia,and climb one of the peak the Malchin 4050 meters above sea level. There are many archaeological sites in the region. The (UNESCO) World Heritage Site Petroglyphic Complexes of the Mongolian Altai is located inside Altai Tavan Bogd National Park. The Altai Mountains have been inhabited for around 12,000 years. The oldest images in the park are from 11,000 to 6000 BC with hunting large mammals and ancient cultures. Thousands of years of petroglyphs show the transition from hunter-gatherer to pastoral ism and later to the current semi-nomadic lifestyle that developed over the last 3000 to 4000 years. 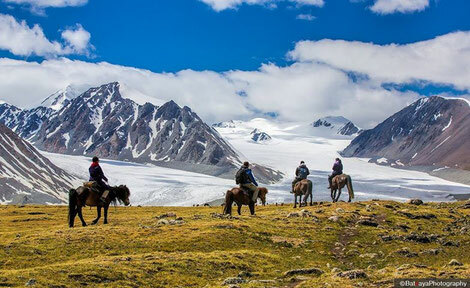 Altai Tavan Bogd National Park is home to Kazakh and Tuvan nomadic ethnic groups. Kazakhs live around Khoton, Khurgan and Dayan Lakes. They spend their summer pasture in the region. Kazakhs are very famous with the hunting tradition of Hunting with Golden Eagle and decorating their large gers (yurts) with embroidered wall hangings and handcrafting arts. Tuvans practice Shamanism and they have their own throat singing technique. However, it is hard to find throat singers among them because few of them mastered this art nowadays. Travelers can visit local families and experience their unique nomadic lifestyle. The busy season is from June to October when temperature is warmer, snow has melted and local tour providers are active operating in the region. The best time for mountains climbing and trekking is between July to September.